According to a recent article in the Harvard Business Review, Corporate Functions - like Sales Academies – often stumble. But there are also many success stories. I would like to share with you the great success of the SIKA Business School, which shows how a Corporate Function can add substantial value. I spoke to Werner Angehrn, the Head of Corporate Training and Development at SIKA. SIKA is a 105 year-old Swiss based manufacturer of specialty chemicals with a global business supplying industry and construction. The chances are that you have been in a building recently that uses bonding, flooring or waterproof technologies from SIKA and you have almost certainly travelled in a vehicle whose glass is held in place with a SIKA adhesive. Around 15 years ago a new CEO joined the company and looked for ways to improve turnover which at that time was around €2bn. He saw business divisions and locations selling in very different ways with varying degrees of success. This, as Werner explains, is how the idea for a SIKA Corporate Way of Selling was born. The structure of SIKA meant that the General Manager in each country had considerable independence, so the SIKA Way of Selling could not be imposed; the General Managers had to buy into the concept. A pilot project to demonstrate the effectiveness of the idea was run before it was rolled out - this later became part of the SIKA Business School. There were certainly some initial challenges. The commercial question of who covers the cost was resolved pragmatically. The country organisations didn’t need to pay for the training as such, but they still had to pay the expenses of the Sales Professionals who went on the courses in Switzerland, so they had to be convinced they would get a return on their investment. Likewise, the Group Management had to be convinced the investment would pay off. Early on in the life of the SIKA Business School, Werner encountered a General Manager who was openly sceptical about how effective the training would be, but he sent his Sales people along anyway. When Werner asked him why he said “I see a room full of Sales people from other countries who are sitting here not selling. And they are costing their General Manager money. So I guess if those GM’s are willing to send people it must work”. It was equally important to persuade the Group Managers and Werner presented the results of the initial training to them in person. As soon as they were confident the academy was delivering results they encouraged the General Managers to send more Sales Professionals on the course. We are all too aware that Sales Training often fails to stick. This is an area where a Corporate Function does have an advantage over an external supplier. The SIKA Sales Trainings always work with the participants own sales opportunities so the effectiveness of the training is measureable. The General Managers at SIKA are not able to send people for training unless they show they have a clear plan for implementing the training as soon as the candidates return. This includes tracking the progress of the sales opportunities handled in the training. As a result of good implementation in daily business, General Managers are seeing great results and demand has driven the expansion of the Sales curriculum. From one course a year when it started the Business School now runs 40 sales trainings a year. Originally all the courses were in English and run in Switzerland, now they are run in a range of languages around the world with 400-500 Sales Professionals a year attending. I asked Werner what SIKA would do things differently if they could start again and he replied that he would move more quickly to a multi language, multi location approach. But I think he was right to make sure everything was running as well as possible before making changes. So why has the SIKA corporate sales training thrived while other Corporate Functions stumble? Well referring back to the article in the Harvard Business Review, the SIKA Business School has kept the Group and General Managers engaged, delivered content which adds substantial value to the business and has been responsive to changing needs. I also like to think that the ongoing support of Infoteam to help deliver the trainings has been important in ensuring the success of the SIKA Way of Selling. Has it really been a success? Well over the past 15 years SIKA has grown from €2bn to €5.6bn – that’s certainly success in most people’s book. 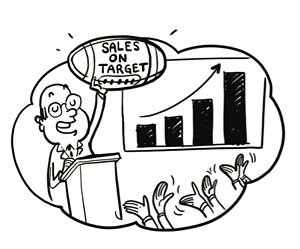 Is your current approach to Sales Training delivering results? Is the content of your Sales Training relevant to your Sales Professionals and their customers? Do you have a common sales language globally?